1. 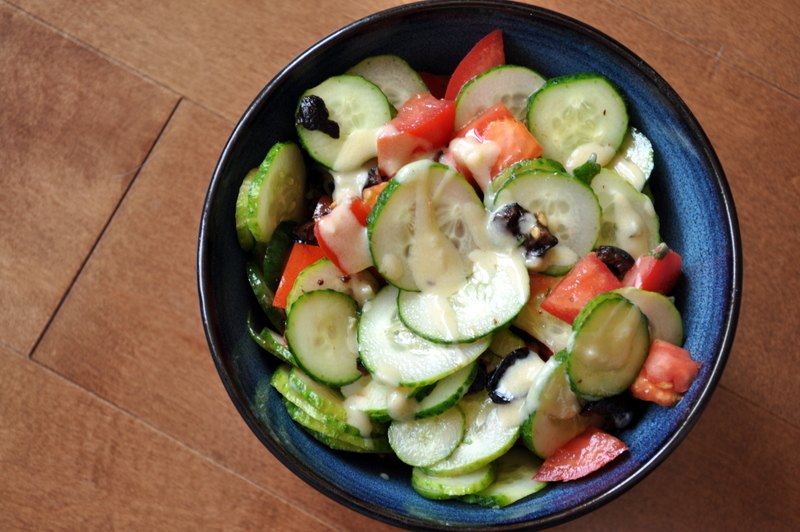 For a less soggy salad, drain cucumber. Place cucumber slices in a colander and allow to drain. Pat dry. I skipped it. 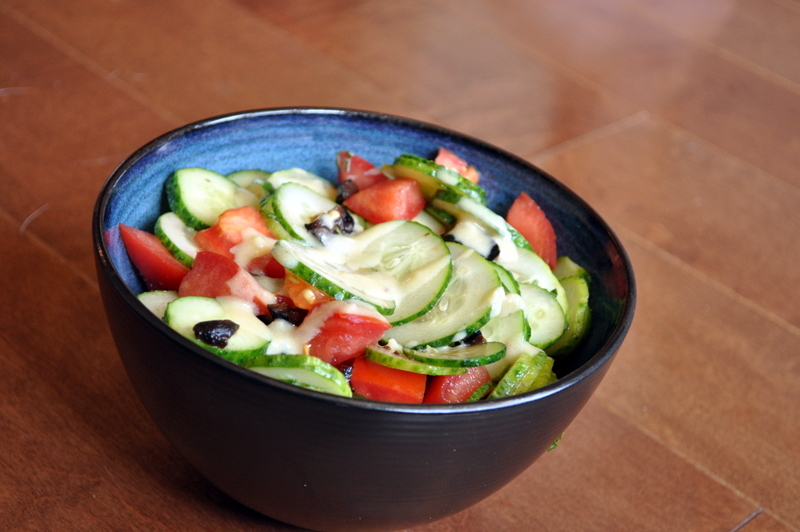 In a medium bowl, place the cucumber, tomato, olives and mint. Stir to combine. 2. In a smaller bowl, combine the tahini, oil, lemon juice, garlic, maple syrup and season to taste. Mix to combine. 3. Prior to serving, drizzle as much dressing as desired overtop. Wonderfully elegantly simple…just the kind of recipe we need these days. We found some beautiful yellow tomatoes at the farmers’ market last week…they’d be fun to include in this salad so I hope they have more this weekend. Many thanks! 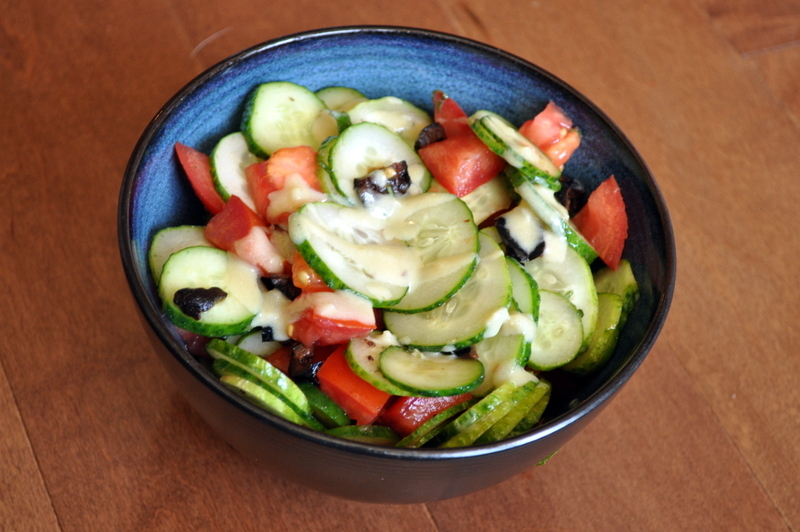 You have to love the simplicity of a perfect tomato & cucumber salad. 🙂 Glad to hear you guys got your hands on some homegrown garden veggies! SO GOOD. Yes! Garlic tahini dressing forever! My kind of stuff! Like the addition of olives in it. I make a similar salad – I like adding artichoke hearts instead of olives, but switching it up sounds good too. I like the dressing! I don’t add tahini to my dressings enough.